Ultra thin design for comfort under your jacket and small storage required on bike. Packs down to 1/2 the size of the competition. ProForm streach panels for simple sizing. Finished sleeves for minimal bulk in wrist area. Glove connections in zipper pocket on sleeve. Simple dual temperature controller connection point for heated gloves. ProForm stretch panels for maximum heat transfer. Soft, heated, Polartek collar wicks away moisture providing all day riding comfort even in the rain. Longer Cut on lower back with heating elements down to the bottom for very, very cold riding. Durable Kevlar reinforced Nichrome heating elements will not leave you out in the cold after years of hard usage. While electrically heated jacket liners and heated vests are offered with a few different types of heating elements, carbon fiber cloth and nichrome wire are the most popular. Most all electrically heated gloves use a nichrome wire heating element. In the future we may all be wearing "copper fiber" heated clothing, this technology shows much promise. For safety reasons, maximum garment lifespan, smaller storage on the bike and more complete heating, Powerlet has elected to use ultra-durable Kevlar reinforced Nichrome wire in its 2009 heated clothing products. There are advantages and disadvantages to using either nichrome wire or carbon fiber panels. Carbon fiber panels were originally designed for car seats and were not required to be crumpled up and folded into a saddlebag. Nor were the seat elements required to be washed on occasion. Carbon fiber panels tend to develop "hot spots" where they are creased, so it is difficult to have the carbon fiber panels turn corners around elbows and the neckline. Therefor most carbon fiber garments do not have heated sleeves or necklines. For these reasons carbon fiber garments tend to have a shorter usable lifespan than Nichrome wire garments. There is also a health concern with carbon fiber panels. Some studies show that it may be a health concern to over-warm the blood to the heart. This excess heat can be additionally complicated by a controller that only provides "low, medium & high" settings. On the other hand Nichrome wire tends to draw more power to deliver the same amount of heat. For some bikes with less excess electrical capacity (EEC) this can be a problem. Powerlet publishes the EEC for most bikes in the "shop by vehicle" section. We use a "star" system to show just how much EEC your vehicle has. 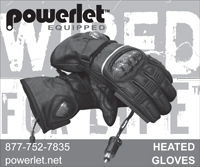 Heated gloves require the least amount of power, typically between 20 and 25 watts. For this reason they can be powered from most any small vehicle. These are almost always made with Nichrome wire. Powerlet uses special Kevlar reinforced Nichrome wire for strength and durability. Heated vests are designed to provide around 40 or 50 watts of heat. This translates into current draws from 2.9 to 4.2 amps at 12 volts. This includes vests from Aerostich, Eclipse, BMW, Gaili and Widder. You may notice that smaller vests of the same brand will draw more current, which actually makes sense; there is less resistive wire in the garment. Heated jacket liners are the warmest and require the most power. Typically these draw 75 to 100 watts depending on the manufacturer. By comparison, items like heated clothing made with nichrome wire or auxiliary lights require significantly more power than a GPS (12 watts) or cell phone (5 watts to charge). Again there are pros and cons to battery or vehicle power sources. While there is no problem riding all day using the vehicles power wource, batteries have a pesky habit of running down at inopportune times. There is a higher long term cost with using a battery pack as these will need to be replaced and can easily cost half the price of the garment. 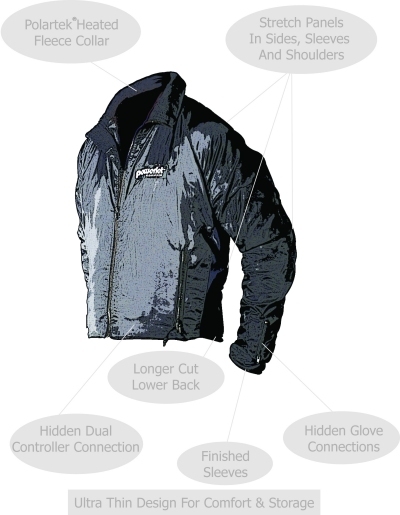 Most heated jacket liners or vests use a temperature controller. Some of the competitors heated clothing come with "low, medium and high" controllers. While these controllers are less expensive to manufacture and sell, they can often be to warm, leaving the rider uncomfortable. Most heated clothing uses either an SAE or 2.5mm x 5.5mm COAX connector. SAE's were more popular a few years ago but most manufacturers now use COAX connectors. Transfer the heat from the garment to the rider. Minimize the losses delivering power to the clothing. For heated clothing to transfer heat to the body it must have a snug fit. 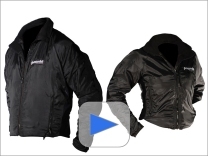 Powerlet heated vests and jacket liners use ProForm stretch panels to provide a snug fit. Large gauge wire and quality power connectors will deliver more power to the garment. Real world losses can total up to 10W for a heated jacket liner, or about 10% of your heat. Using a minimum of sixteen gauge wire and high current connectors will reduce this loss considerably. Powerlet socket kits use expensive (lots of copper) 14 gauge wire to further minimize the power transfer losses. There is no worry of being electrocuted in the rain by Powerlet heated clothing.